One Palestinian youth was killed by Israeli gunfire on Wednesday afternoon, while at least 19 others were injured as clashes continue all over the occupied West Bank, Jerusalem and Gaza.Islam Rafiq Obeid, 23, was shot by Israeli troops near the illegal Israeli settlement located in Tel Rumeida area of Hebron old city, southern West Bank. Witnesses said that Obeid was shot eleven times by Israeli troops manning a checkpoint there. Soldiers also detained Palestinian medics and stopped them from providing Obeid with medical help. According to witnesses, he was left to bleed to death by Israeli forces that surrounded the area and closed it. Obeid is the 7th Palestinian to be killed by Israeli troops in Hebron in the past 72 hours, the Palestinian Ministry of Health reported on Wednesday. The Health Ministry said that 65 Palestinians, including 14 children, have been killed by Israeli gunfire since the beginning of this month so far. 48 of them have been killed in the occupied West Bank and occupied Jerusalem, 17 in the Gaza Strip, including a pregnant woman and her two year old child. Moreover, clashes between local youth and invading Israeli troops were reported on Wednesday in Jerusalem, Bethlehem, Hebron, Nablus and Ramallah. Palestinian sources said that at least 19 Palestinians were injured by Israeli gunfire and tear gas during clashes Wednesday. Among the injured were two children who were hit with live gunfire in Hebron’s old city, meanwhile a teenager was hit in the head by a rubber-coated steel bullet during clashes with Israeli soldiers at the entrance of Beit Fajar village near Bethlehem. On Wednesday at dawn Israeli forces invaded Palestinian communities in occupied West Bank and Jerusalem, searched and ransacked residents’ homes then kidnapped 72 Palestinians, including university students and children. The Palestinian Political Prisoners Society said in a press statement that kidnappings and home searches took place in Jerusalem, Hebron, Bethlehem, Ramallah and Jenin. In Hebron district alone troops kidnapped 31 residents. 3. Amjad Hatem al-Jundi, 17, Hebron. 4. Thaer Abu Ghazala, 19, Jerusalem. 5. Abdul-Rahma Obeidallah, 11, Bethlehem. 6. Hotheifa Suleiman, 18, Tulkarem. 8. Mohammad al-Ja’bari, 19, Hebron. 9. Ahmad Jamal Salah, 20, Jerusalem. 11. Mohammad Said Ali, 19, Jerusalem. 13. Ahmad Abdullah Sharaka, 13, Al Jalazoun Refugee camp-Ramallah. 14. Mostafa Al Khateeb, 18, Sur-Baher – Jerusalem. 15. Hassan Khalid Manassra, 15, Jerusalem. 16. Mohammad Nathmie Shamassnah, 22, Kutneh-Jerusalem. 17. Baha’ Elian, 22, Jabal Al Mokaber-Jerusalem. 18. Mutaz Ibrahim Zawahra, 27, Bethlehem. Hit with a live bullet in the chest during a demonstration. 19. Ala’ Abu Jammal, 33, Jerusalem. 20. Bassem Bassam Sidr, 17, Hebron. 21. Ahmad Abu Sh’aban, 23, Jerusalem. 23. Fadi Al-Darbi , 30, Jenin – died in Israeli detention camp. 24. Eyad Khalil Al Awawdah, Hebron. 25. Ihab Hannani, 19, Nablus. 26. Fadel al-Qawasmi, 18, Hebron. Shot by paramilitary settler, Israeli soldier caught on film planting knife near his body. 31. Mohannad al-‘Oqabi, 21, Negev. Allegedly killed soldier in bus station in Beer Sheba. 32. Hoda Mohammad Darweesh, 65, Jerusalem. 33. Hamza Mousa Al Amllah, 25, from Hebron, killed near Gush Etzion settlement. 34. Odai Hashem al-Masalma, 24, Beit ‘Awwa town near Hebron. 35. Hussam Isma’el Al Ja’bari, 18, Hebron. 36. Bashaar Nidal Al Ja’bari, 15, Hebron. 37. Hashem al-‘Azza, 54, Hebron. 39. Mahmoud Khalid Eghneimat, 20, Hebron. 40. Ahmad Mohammad Said Kamil, Jenin. 41. Dania Jihad Irshied, 17, Hebron. 42. Sa’id Mohamed Yousif Al-Atrash, 20, Hebron. 43. Raed Sakit Abed Al Raheem Thalji Jaradat, 22, Sa’er – Hebron. 44. Eyad Rouhi Ihjazi Jaradat, 19, Sa’er – Hebron. 45. Ezzeddin Nadi Sha’ban Abu Shakhdam, 17, Hebron. Shot by Israeli military after allegedly wounding soldier, then left to bleed to death. 46. Shadi Nabil Dweik, 22, Hebron. Shot by Israeli military after allegedly wounding the same soldier, then left to bleed to death. 49. Shadi Hussam Doula, 20. 50. Ahmad Abdul-Rahman al-Harbawi, 20. 52. Mohammad Hisham al-Roqab, 15. 53. Adnan Mousa Abu ‘Oleyyan, 22. 54. Ziad Nabil Sharaf, 20. 56. Marwan Hisham Barbakh, 13. 57. Khalil Omar Othman, 15. 60. Yihya Abdel-Qader Farahat, 23. 61. Shawqie Jamal Jaber Obed, 37. 62. Mahmoud Hatem Hameeda, 22. Northern Gaza. 63. Ahmad al-Sarhi, 27, al-Boreij. 65. Khalil Hassan Abu Obeid, 25. Khan Younis. Died from wounds sustained in protest earlier in the week. 1 & 2. 10/1 – Eitam and Na’ama Henkin, both aged around 30 years old, killed in drive-by shooting near Itamar settlement. 3. 10/3 – Nahmia Lavi, 41 – Rabbi for Israeli military. Killed in Jerusalem stabbing attack near Lion’s Gate when he tried to shoot the attacker but had his weapon taken. 4. 10/3 – Aaron Bennet, 24. Killed in Jerusalem stabbing attack near Lion’s Gate. 8. 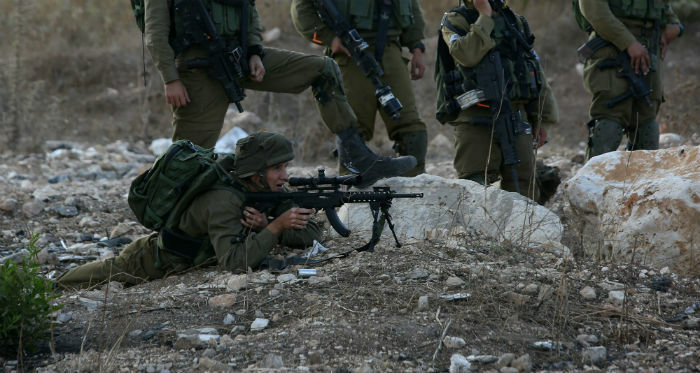 10/18 – Omri Levy, 19, Israeli soldier with the Golani Brigade who had his weapon grabbed and turned against him by an Israeli resident. An additional 2 Israelis that were initially claimed to have been killed in attacks were actually killed in car accidents.